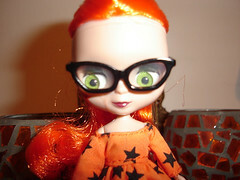 Long time no blog so will give a whirlwind flit around some thingies. SC and me went to the RDU 30th birthday gig on Sunday 26 February at the Oval at Canty Uni (before that to the Avice Crafty fair – bought quince pate and quince&manuka honey). Photo sess with frame, SC did some ingenious painterly adapting. Love his work. 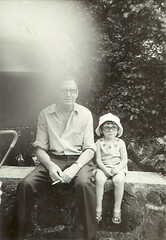 On a similarly arty tip, I used the Rasterbator on this photo of me and Grandad and now it adorns my lounge. Thanks to Mo for the heads up on this wonderful little tool. 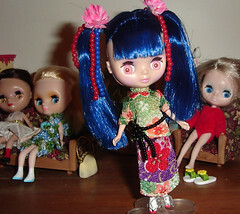 2 new Blythes (+ came back from hols with a Blythe wallet and mirror). Orange Pumpkin with her hot little glasses and French maid outfit, and the lovely Asian Butterfly with her adornments and silky blue hair. They have got names now too – Pumpkin is “Raikkonen Peach” and Butterfly is “Kitten Wentworth”. 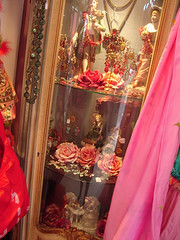 Favourite shop in Melbourne – Madame Pompadour. Boudoir to the Max. Another little nifty treat – the iriver I bought last minute at duty free. What a toy! am wired for sound. Off to celebrate the birthday of my Jazzacise and Saturday working buddy TulipBlack. Night kittens.